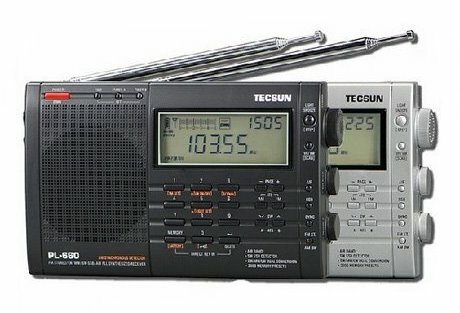 While the Tecsun GR-168 is my current pick amongst self-powered shortwave radios, performance is only mediocre compared with a proper, hobby-grade receiver with SSB. 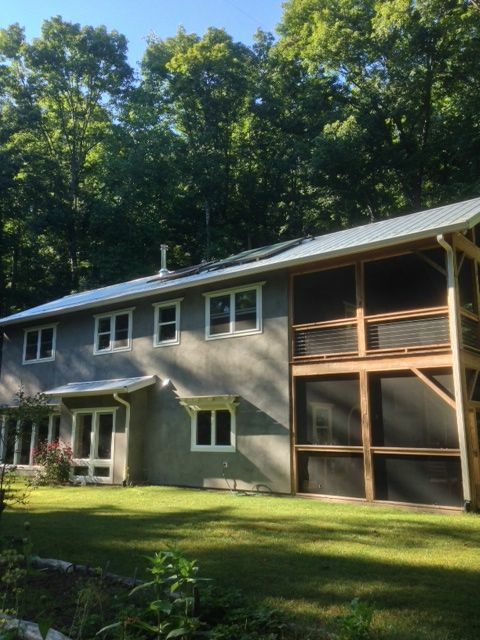 What’s the best system for off-grid living? From time to time, I’m asked this question in the “comments” section of the website or via email. Recently it came up again, and I thought it might make sense to answer it here, and also open it for discussion. “[H]i, I am looking for a SW radio that can be used in an off-grid location (rechargeable/ wind-up/ 12 volt DC/ or solar powered), that can pick up a wide range of English speaking stations from here in SW Spain, fantastic audio quality, in the £100-200 price range, and can pick up ham etc transmissions in an emergency (with SSB?). I know NOTHING about SW, so the CCRadio-SW looked about right, except it doesn’t have SSB. Any other suggestions? Phil, I’m glad you asked. I may be uniquely qualified to answer this question, as I live in and work from a solar house that is off-grid at least some of the time, and I run a charitable non-profit, Ears To Our World (ETOW), that uses shortwave radio for educational purposes. ETOW works in schools, homes, and entire communities that are very often extremely remote, and, by default, off-grid. So, you have a number of great options to choose from–and whatever options I overlook, our fellow SWLing Post readers will surely supply. As the ability to receive SSB signals is important to you (and I agree), all of these options will take this requirement into account. You’ll notice that I’m not elaborating on crank/wind-up radios; while there are many of these on the market, none include SSB as an option. Fewer and fewer even include shortwave radio as an option. 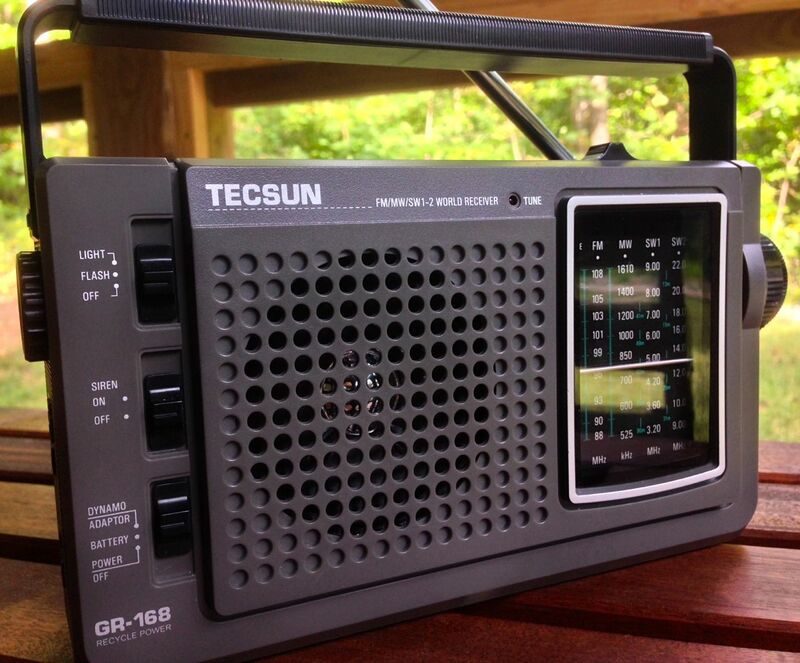 With that said, my current pick is the Tecsun GR-168 (photo above). Another to consider is the EU/Asian version of the Eton Rover (US versions lack SW, but feature NOAA frequencies). Following are the options I would suggest for you–or for anyone looking to add a solar-powered radio system to their off-grid set-up. Most of the good portable radios on the market use AA batteries and can run quite a long time on a set. I would recommend purchasing the Tecsun PL-660, Sangean ATS-909X, or the Sony ICF-SW7600GR. The PL-660 is possibly the best choice for ease of use and overall value; it’s an impressive little radio, and has good audio fidelity for the size. Since these radios operate from AA batteries, I would simply purchase a 12V AA battery charger, if you have 12 volts DC available. A PowerFilm Solar AA charger unfolded and charging on left, folded panel on right. The other option would be to purchase a solar AA battery charger. I’ve tested a lot of these, and the best I’ve found are made by PowerFilm Solar here in the USA. What I like about these solar chargers is that they can charge either two or four batteries at a time––the panel folds out and has enough wattage to charge depleted cells within a few hours of sunlight exposure. Folded up, they’re small enough (a little larger than a wallet) to be used for travel. 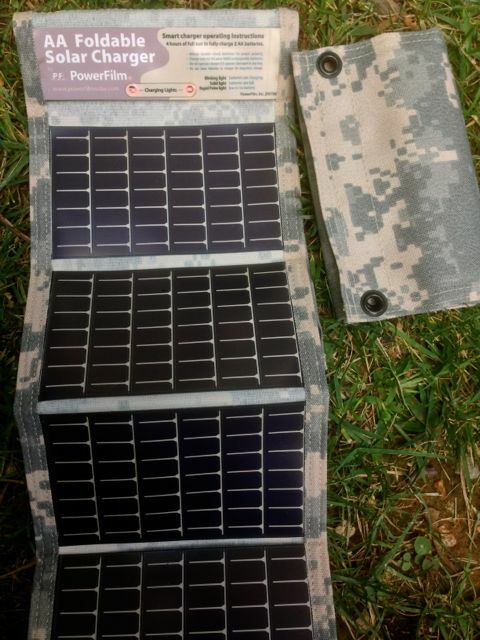 I have used PowerFilm’s solar chargers extensively and they continue to impress. Note, however, that they are not waterproof––you cannot leave them outside in rainy conditions. This radio/panel combo can be purchased for under $250 US (£155/185 EUR). If you have access to 12 volts DC in your home or cabin, and you’re less concerned about portability, then a tabletop receiver might fit your price range and will offer you better performance, when coupled with a reasonable outdoor wire antenna. The Alinco DX-R8: an excellent receiver for the price. You can find them used for around $350 US. I ran one off solar power here at my home for almost 2 years. 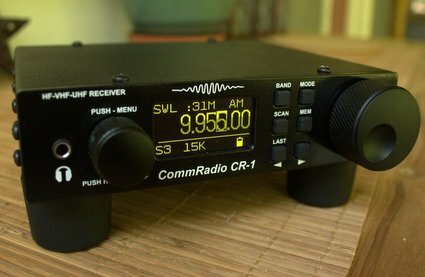 The CommRadio CR-1: A new product this year. A bit out of your £100-200 price range, Phil, but worth considering as not only is it beautifully engineered, but it’s portable, and operates anywhere from 6 to 18 VDC! As a bonus, it has a built-in battery that will power it for hours. I’m due to publish the full review of the CR-1 very soon–here’s a quickie. One side note: It’s possible–depending on the type you use–that your home’s solar charge controller(s) could inject a lot of noise into your daytime shortwave radio listening. My charge controller does this, but I can turn it off and, if it becomes too much of a problem, actually modify it to do charging with less switching. This option is identical to option 2, other than instead of buying a receiver, you buy a transceiver. I’m talking about becoming a licensed amateur radio operator or “ham.” Living where you do, and being a bit of a preparation guru, I can assure you that a ham radio license is a true asset and can keep you connected with the world when everything else fails or when you want to chat with a friend 3,000 miles away. It’s well beyond the scope of my advice here to cover amateur radio–it’s a vast and multi-faceted hobby–but as a ham (callsign K4SWL–and, formerly, M0CYI in the UK) I can tell you that becoming one is a decision you’re not likely to regret. 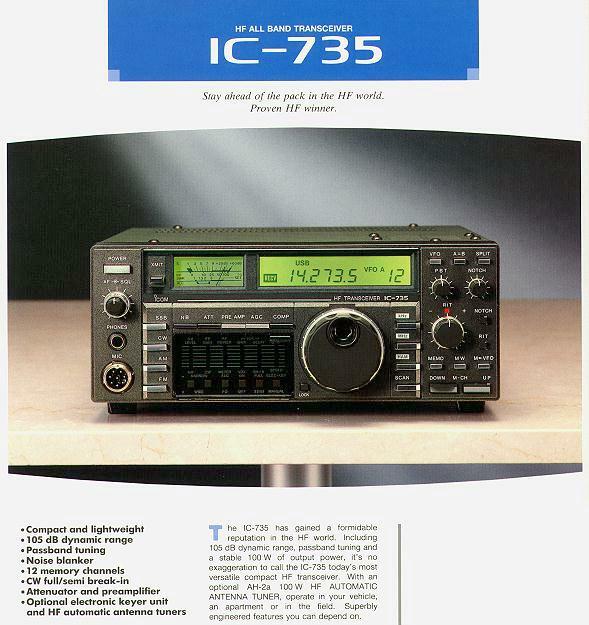 A brochure of the original IC-735. These can be easily found used for $300-350 US (220-260 EUR). 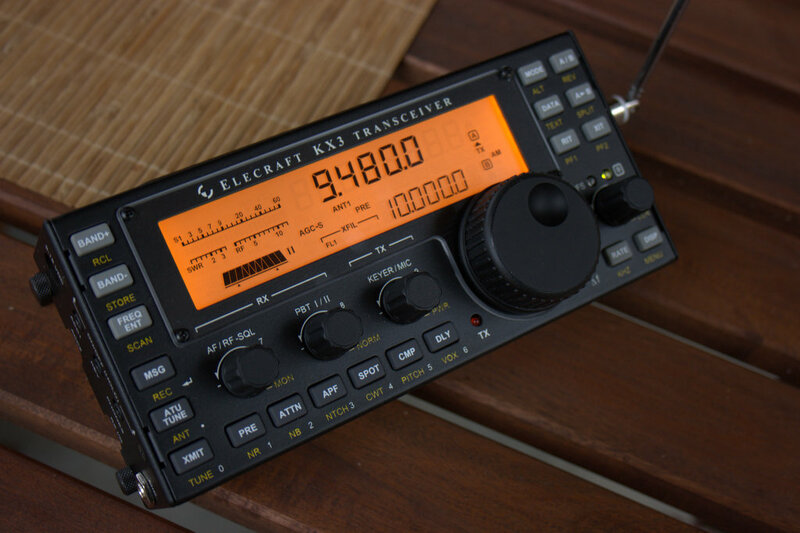 If you’re licensed, you can purchase a general coverage ham radio transceiver and not only be able to use the rig for ham radio purposes, but also for all aspects of shortwave radio listening. I spent many years using the (now very affordable) Icom IC-735 as my shortwave receiver. Though I have dedicated receivers at home, I now use the Elecraft KX3 for ham radio and receiving on the go. I recently posted a review of the KX3 that can better explain in detail. Phil, since you’re from the UK, consider contacting the RSGB and asking about becoming a ham in Spain (or getting licensed in the UK and getting a Spanish call sign). If you lived in the US, I’d advise you contact the ARRL, or in Canada the RAC. Most countries, however, have a support organization for amateur radio–the IARU can help guide you. I’m sure SWLing Post readers may also have suggestions for off-grid SWLing–please check this post’s comments. Readers: be sure to check out Phil’s website about simple, off-grid living in southern Spain. Phil, thanks for the question! This entry was posted in Emergency Preparedness, Ham Radio, How To, News, Preparedness, Radios, Reviews, Shortwave Radio and tagged Ham Radio, How to shortwave solar, Off-Grid radio, Solar Radio, Solar Shortwave Radio, Which Solar Radio, Which Solar Shortwave on September 23, 2013 by Thomas. Great discussion! So a question how does GREEN-88 compare to the Tecsun GR168? The RTLSDR can now be used with an android smart phone using free (though a paid upgraded version is available) software. So power use could be pretty low. Hi again Thomas. What can I say? An excellent post. Packed full of information and written in a way that is all about encouragement, a real breath of fresh air after all the other sites I have visited. I now feel pointed in the right direction and my appetite whetted not only for SW, but one day soon Maureen will finally fulfil a long held dream of getting her ham licence too. I hope you don’t mind but I made a pdf of the post and have added it to my site, plus a link to swling.com. Looking forward to further postings and developing further my knowledge about this great new world. Can anyone comment on how the tecsun GR-168 compares to the GR-88 or the GR-138? I cannot find a review of it anywhere on the web. I have a strong preference for the GR-88 (formerly Grundig FR-200). I should have mentioned it as well. I think, performance-wise, it runs neck-and-neck with the GR-168. I prefer the fact that the GR-88’s handle collapses and that it has a front-mounted (serviceable) LED. I have not tried the Tecsun GR-138 yet, but I’ll put it on my list! Both the GR-88 and GR-168 have fine tuning controls too. Not sure about the GR-138. In summary: go for the form factor you prefer. All of these are analog radios and will have similar performance. Hi again Thomas. What an amazing reply, am in awe! Have copied it (no internet at the house yet), and will read later, with a reply if necessary later in the week. Will also check out your website too, the photo makes it look wonderful.